Today I’m really excited to show you a powerful new feature of AWS CloudFormation called Macros. CloudFormation Macros allow developers to extend the native syntax of CloudFormation templates by calling out to AWS Lambda powered transformations. This is the same technology that powers the popular Serverless Application Model functionality but the transforms run in your own accounts, on your own lambda functions, and they’re completely customizable. CloudFormation, if you’re new to AWS, is an absolutely essential tool for modeling and defining your infrastructure as code (YAML or JSON). It is a core building block for all of AWS and many of our services depend on it. There are two major steps for using macros. First, we need to define a macro, which of course, we do with a CloudFormation template. Second, to use the created macro in our template we need to add it as a transform for the entire template or call it directly. Throughout this post, I use the term macro and transform somewhat interchangeably. Ready to see how this works? Creating a macro has two components: a definition and an implementation. To create the definition of a macro we create a CloudFormation resource of a type AWS::CloudFormation::Macro, that outlines which Lambda function to use and what the macro should be called. The fragment portion of the payload contains either the entire template or the relevant fragments of the template – depending on how the transform is invoked from the calling template. The fragment will always be in JSON, even if the template is in YAML. The requestId needs to be the same as the one received in the input payload, and if status contains any value other than success (case-insensitive) then the changeset will fail to create. Now, fragment must contain the valid CloudFormation JSON of the transformed template. Even if your function performed no action it would still need to return the fragment for it to be included in the final template. To use the macro we simply call out to Fn::Transform with the required parameters. If we want to have a macro parse the whole template we can include it in our list of transforms in the template the same way we would with SAM: Transform: [Echo]. When we go to execute this template the transforms will be collected into a changeset, by calling out to each macro’s specified function and returning the final template. 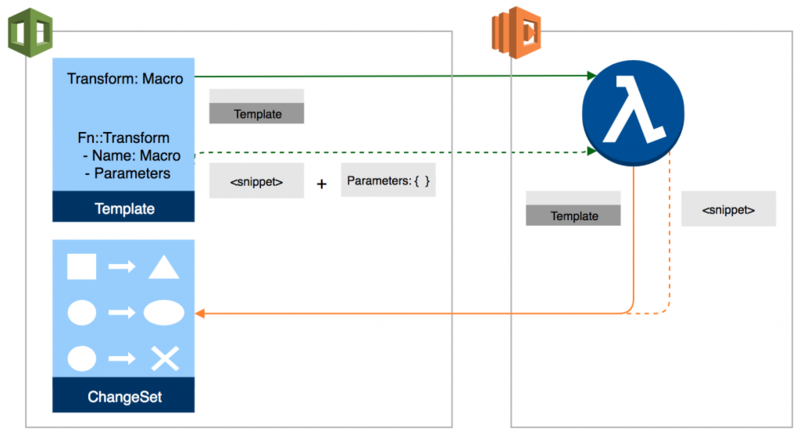 The CloudFormation service creates a changeset for the template by first calling the Echo macro we defined and then the AWS::Serverless transform. It will execute the macros listed in the transform in the order they’re listed. The inline transform will have access to all of its sibling nodes and all of its children nodes. Transforms are processed from deepest to shallowest which means top-level transforms are executed last. Since I know most of you are going to ask: no you cannot include macros within macros – but nice try. When you go to execute the CloudFormation template it would simply ask you to create a changeset and you could preview the output before deploying. If you end up building something cool I’m more than happy to tweet it out! CloudFormation Macros are available today, in all AWS regions that have AWS Lambda. 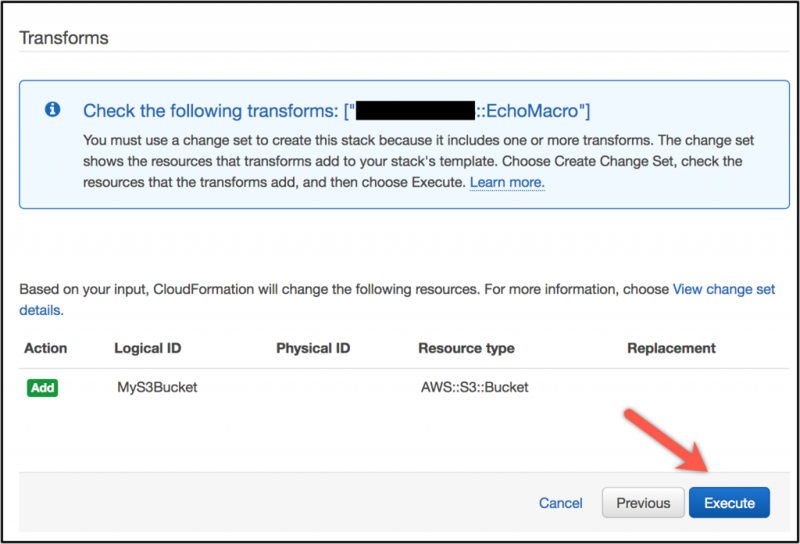 There is no additional CloudFormation charge for Macros meaning you are only billed normal AWS Lambda function charges. The documentation has more information that may be helpful. This is one of my favorite new features for CloudFormation and I’m excited to see some of the amazing things our customers will build with it. The real power here is that you can extend your existing infrastructure as code with code. The possibilities enabled by this new functionality are virtually unlimited.